The Urban Greening Program is a partnership between the Metropolitan St. Louis Sewer District (MSD) and the St. Louis Development Corporation (SLDC), including the Land Clearance for Redevelopment Authority (LCRA) and Land Reutilization Authority (LRA), to spend up to $13.5 million on the demolition of vacant and abandoned buildings. The goal of the UGP, as a part of MSD's Project Clear, is to remove impervious surface and improve stormwater absorption in the Bissel Point Watershed. The UGP demolition program is guided by a prioritization model called the Vacancy Demolition Prioritization Model (below). 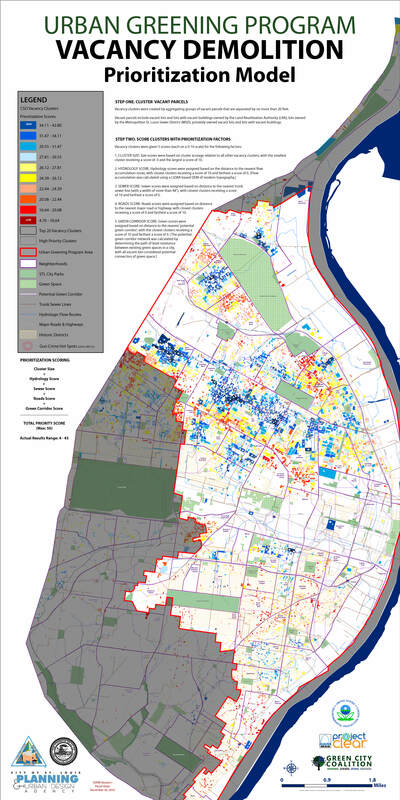 This novel approach uses Geographic Information Systems (GIS) to identify demolition candidates based on several criteria, with the ultimate goal of removing impervious surface where it is most needed to improve combined sewer overflows, and where conversion to new green spaces could contribute to a connected green network system that provides social, economic, environmental, and health benefits to residents most impacted by vacancy. The results of this model are then combined with neighborhood knowledge gained through Green City Coalition's community workshops and participatory mapping exercises. The combined findings guide the locations for demolitions and new community green spaces.